Any Danish farmer worth his salt in the 1930’s, 40’s and 50’s, had an aerial photo of his farm on the wall. Many Danes, including myself, still remember those photos, when visiting relatives in the country-side. 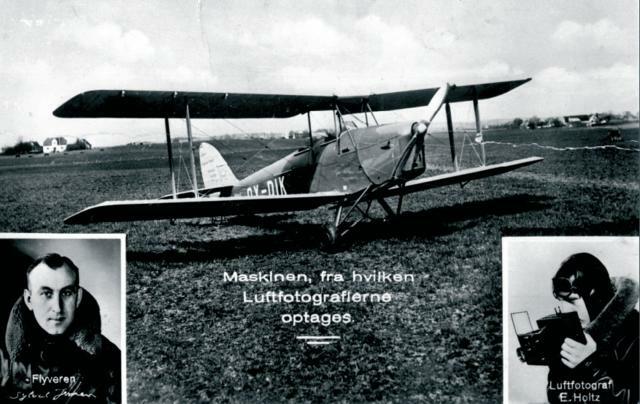 Viggo Sylvest Jensen was born in 1909 and was (I think) the only real Danish barnstormer. He started his company during the great depression. He was the owner of a Tiger Moth, and made his money by flying from town to town selling aerial photos of farms and estates. Business was remarkably good. It turned out that even owners of smaller farms were willing to pay for a photo of their home. He started a flying circus, later on in his career when flying became more commonplace. He had the fully acrobatic KZ-VIII aircraft commisioned. It was completed in 1950 and was flown by the ex WWII Royal Air Force pilot, Peter Steen. Viggo Sylvest also commisioned SAI to make a copy of the Ellehammer Standard Maskine, and toured with these planes all around Denmark. His remarkable collection of photos is now situated in the Royal Danish Library, and is today a treasure-trove for historians. It’s interesting to note that the museum is still offering photos from the collection for sale. I’m out of league here. Too much brain power on display here!